We know how much your pet matters to you because our pets mean the world to us. Our aim is simple, to help treat your pet naturally thus avoiding unnecessary prescription drugs or indeed surgery which can be invasive. 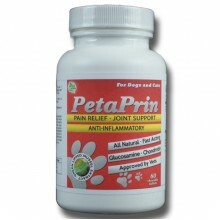 PetaPrin helps ease joint pain and stiffness which affect millions of dogs of all ages. Obesity, old..